Experience: He learned his craft in restaurants in Switzerland, France, England and Bermuda. From 1998 to 2007, he operated Ho-Ho-Kus Inn, in Ho-Ho-Kus, N.J. 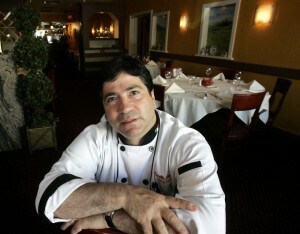 In 2009, he opened Mamma Vitttoria Restaurant in Nutley, N.J., dedicated to his deceased mother. Cooking style or philosophy: To be 25 percent very conservative for clients and customers who have sponsored me for many years, giving them what they like and what they know, even if sometimes it’s against my philosophy as a cook. But I don’t want to go out of business because I want to be a celebrity super chef. Thirty-percent of the menu comes from a different part of Italy. Another 30 percent are creative items that I put together. Why we chose him: Russodivito has run one of Rockland’s most popular restaurants for 24 years, and he takes care of his customers. Yet he’s always adding things to his restaurant to keep fresh and modern, from an herb garden to a demonstration kitchen to new items on the menu. How he keeps it fresh: I go to Europe, mostly to Italy. I go to the wine festival in Verona. And I take my maitre d’ and sommelier to Italy for educational seminars and we choose a different region. I’m also involved with Gruppo Virtuale Cuochi Italiani, a blog for chefs from all over the world to keep in touch with the latest food. Recently, we all came up with a recipe for ice cream parmigiano to celebrate the region Emilia–Romagna, where they make the Parma prosciutto, the parmigiano reggiano and balsamic vinegar. Ours was a garden melon, a parmigiano basket, ice cream parmigiano with vanilla and Parma prosciutto. It was very simple, and we put a hint of 12-year-old Balsamic vinegar on top. And that ended up on our specials list. Advice for the new chefs: Don’t be prima donnas. If you want to be a prima donna, you need to have a lot of money and you need to be in an area that is full of cosmopolitan people who are willing to experiment. The dream of the chef is to go to the market, cook the items that he feels and then have the customer come in to choose from four appetizers, four entrees and four desserts. Every night the food would be finished and that would be great. But if you don’t have the capital and if you’re not extremely good, it’s very very hard. Peter D. Kramer contributed. Photo by Vincent DiSalvio/TJN.